Can Danish discounter Netto save Sainsbury's bacon? The Scandi supermarket returns to the UK with a joint venture and its first new store. Britain has developed an appetite for all things Scandinavian over the last few years. Many of us have been gripped by Danish TV drama the Killing and Sweden's Girl with the Dragon Tattoo books, while IKEA has long been a staple brand in British homes. Sainsbury’s is hoping to tap into this as it brings Danish discount supermarket Netto back to Britain. British supermarkets have been feeling the squeeze lately as German discounters Aldi and Lidl have scraped together a combined market share of more than 8% and they're still growing fast. Researchers expect discounters' sales to double to £20bn in the next five years. Teaming up with Netto’s parent company Danske Supermarked for a 50:50 joint venture, Sainsbury’s kicked off a bid to take back some of that market today. Like its German rivals, Netto will have a much smaller range than the big four supermarkets and will offer short-term ‘spot deals’ such as £5.50 bottles of Prosecco and a two-pack of sirloin steaks for £3.69. Its range is specifically designed for British palettes but will also have a Danish flavour, including 39p pastries, curried herring and Lego. 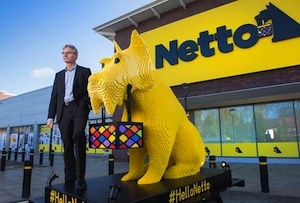 Netto’s first incursion into Britain began in 1990 and reached 193 stores here before selling them to Asda in 2010. The first of 15 new stores to be launched this year opened today in Leeds and four more will open later this month, all in the north of England. Memories of Netto’s previous UK incarnation aren’t exactly inspiring, but now that Lidl and Aldi have blazed a trail for discount supermarkets Sainsbury's has the luxury of learning from their successes and mistakes. The danger is if it learns too well it could end up cannabilising its own sales.